This 512 bytes MSX turboR demo shows a MSX logo-wipe and a cool plasma effect. A 512bytes MSX1 demo created by Nyyrikki, inspired by his mother. A 512 bytes MSX2 demo created by Nyyrikki shows the Finnish flag moving over a plasma background. The demo of people who do a cartwheel. The demo that some cats move around. It runs on MSX-BASIC for MSX1. 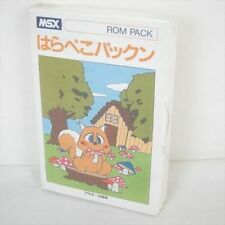 The archive includes the bas files and the diskimage for MSX emulator. Tiny pseudo 9 bit basic demo by Yukio. This small does program makes it look as if your screen is melting. An animated Christmas demo-card for your enjoyment. Hybrid ROM for MSX2 and V9990 videochip featuring a great tune by Meits. vdpmusic is a proof of concept for playing music through the VDP. It manipulates the video noise that's audible when you connect the MSX to an old CRT television. A squarewave melody is created by alternating between bright and black background.